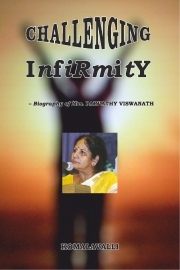 Description of "Challenging Infirmity (eBook)"
This biography, Challenging Infirmity, is truly a tribute to the commendable services rendered, and the positive impact made, by Mrs. Parvathy Viswanath on the lives of so many people associated with her. The author has made all efforts to bring out the many aspects of Parvathy’s personal and professional life in a lucid way, which makes the book an interesting read. It is not easy for a mother to reconcile herself to the fact of the birth of her child the chromosomal defect. It is nobody’s fault really but one does find it difficult to accept the reality without guilt, aversion or self-pity. Against that perspective Parvathy has been an ideal mother to her son. That was not all. She decided to do something about it –start an organization AIKYA – to help mothers, parents – to bring up such children with Down’s Syndrome and learning disorders of various categories. She plunged into it heart and soul and has spent years of dedicated service.So many mothers have had the benefits of AIKYA helping their children face this world, the family and the society through AIKYA. It is amazing to see her son Prabhu. He has grown to be quite a handsome guy. He now works in an office, and quite efficiently.He is gainfully employed in mainstream inclusive society and received several awards including "National Role Model award" from the President of India. This biography is a success story of a mother of a Down syndrome child. And she is an epitome of service to be emulated by others. Reviews of "Challenging Infirmity (eBook)"